The song actually does have lyrics, but they were abandoned, mercifully, for the robust orchestral version you are familiar with. I loved this show, but ya just gotta wonder – would it have killed them to have had a Cartwright daughter? Or wife? At some point, grown men living at home with Pa got to be a bit strange. The Cartwright’s thousand-square-mile Ponderosa Ranch is located near Virginia City, Nevada, site of the Comstock Silver Lode. The name, Ponderosa, comes from the many ponderosa pines growing on the ranch. Ben Cartwright (Lorne Greene) was the quintessential father figure. Eldest son Adam (Pernell Roberts) was the smart one. Hoss (Dan Blocker) was the gentle giant. The youngest, Little Joe (Michael Landon) was the firebrand. Over time, Lorne Greene came to have more influence over scripts. He was a serious pacifist, so the show’s level of rough action decreased as his power increased. As a consequence, Bonanza was less violent than other Westerns. In Star Trek terms, Ben Cartwright was more Jean Luc Picard than James Kirk. He talked first, shot second. 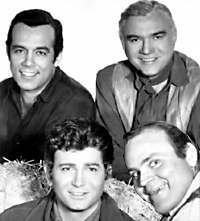 Pernell Roberts left the show in 1965, which most thought was a loss. David Canary was added as ranch hand Candy. During the summer hiatus of 1972, Dan Blocker suddenly died. 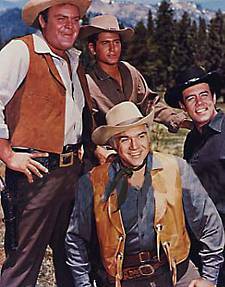 Dan Blocker died in 1972 after a surgery, Ray Teal in 1976, Victor Sun Yeng in 1980 of accidental asphyxiation, Lorne Greene died in 1987 of pneumonia, Michael Landon died in 1991 of pancreatic cancer and Pernell Roberts also of pancreatic cancer in 2010. 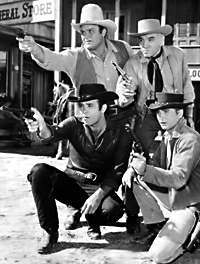 Each appeared in episodes of Wagon Train before Bonanza. Email for details. TV Guide’s Bonanza Page, with TV Listings, Photos, Videos, Exclusive News and More. See how the TV Western Stars look today! 100s of Doug's pictures in one place!